Is Sophie la Giraffe worth all your Euro? 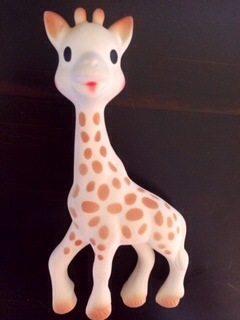 We’re talking Sophie la Giraffe…..
Oh sophie with your big doe eyes and rosy pink cheeks are you really worth 20+ bucks? Sophie has been soothing sore gums since 1961! She is made of natural rubber from the sap of a Hevea tree so she is BPA and phthalate free. Her spots and characteristic smiling face are painted with food paint so she is safe for your little one to nom on. Sophie the giraffe’s black eyes and soft brown spots are supposedly visually stimulating and her long neck and legs are easy for your baby to hold onto to. Her beginnings started in Europe however she is making more of an appearance stateside thanks to celebrities’ children rocking gums out with Sophie the giraffe in tow. Sophie is so tre chic when compared to her gaudy, brightly colored counterparts. We found Sophie at Sam’s club of all places right next to the bulk diapers and a Similac formula container that is so big it won’t fit on my pantry shelf. She doesn’t seem so chic on the shelves of a bulk store but the price was right. 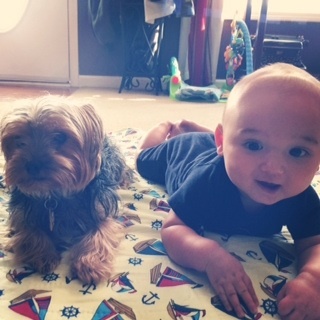 My husband was skeptical of Sophie because lord we have 10 other teething toys our dogs are more interested in than Mason. We assume we are on the verge of teething at almost 5 months old with the constant stream of drool, unreasonable crankiness, and of course the chewing and sucking on anything he can get his slimy drool covered hands on. So we decided to give Sophie a try. Honestly, she was a hit from the moment he saw her and it’s been a love affair ever since. He recognizes her immediately now and he has no problem manipulating her from hand to hand and obviously from hand to mouth. 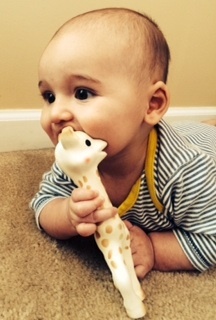 He will stick any available giraffe limb (or her head) in his mouth and chew away to his hearts content. My only qualm (other than the price) with Sophie is that she has a squeaker. My dogs find that Sophie’s soft malleable body is also appealing to chew on and the fact she has a squeaker is a bonus for them. I’m constantly catching them trying to drag poor Sophie off tables because they cant resist getting their furry paws all over her. In conclusion, my personal experience with Sophie has been a good one. She is pricey considering she is a dang teether but 20 bucks is a small price to pay when it comes to the terrors of teething. This little mademoiselle is staying.